I’ve decided to try and do a watercolor painting every day this month. Or at least, work on a larger project. I’m not gonna put too much pressure on myself, as we all know life happens, but this little sketch took about a half hour total, including drawing time. I could’ve (and probably should’ve) devoted more energy to shading, but time didn’t allow. Anyway, I think I can devote a half hour or so a day to improving my work in a medium I so enjoy. This loose kind of watercolor work calls me even more loudly….so, maybe I’ve fallen even harder for watercolor than before? hehe. We’ll see how this goes. (Colors in pear: cerulean, cad yellow, azo yellow, winsor orange, cad red hue, burnt sienna (I think); background: cobalt blue, cobalt turquoise, ultramarine blue – virtually all M. Graham.). I think the shadow is probably off, but when I painted, with my lighting, there actually was no shadow, so I had to imagine the light coming from the left, and do the best I could. For me and many of my American friends, tonight starts the weekend, because most businesses are closed tomorrow to celebrate Independence Day. I wish everyone who celebrates a safe and happy Fourth, and (of course) lots of purple paint puddles galore! Peace. Thanks, Debi! Here’s to improvement between now and the end of the month! I like this direction a lot. And you are going to be pleased and surprise yourself with this project. Thank you. I hope so. I think these kind of goals are good. I started drawing something every day in my art journal that I do at night …. vs just having fun in it….and I’ve seen my drawing skills improve. Well, anything will improve if you do it every day! So….here’s to improvement. 🙂 Have a great weekend! This is a great pear! Thank you, Richard! I really appreciate your visit & comment! I’ve never done a pear before, but now that I have, I can see why so many artists work with them. They have such interesting little shapes, colors, and nuances! Thanks, Jodi! I hope you do try a pear. I actually bought this specifically for painting, as we don’t like them, lol. 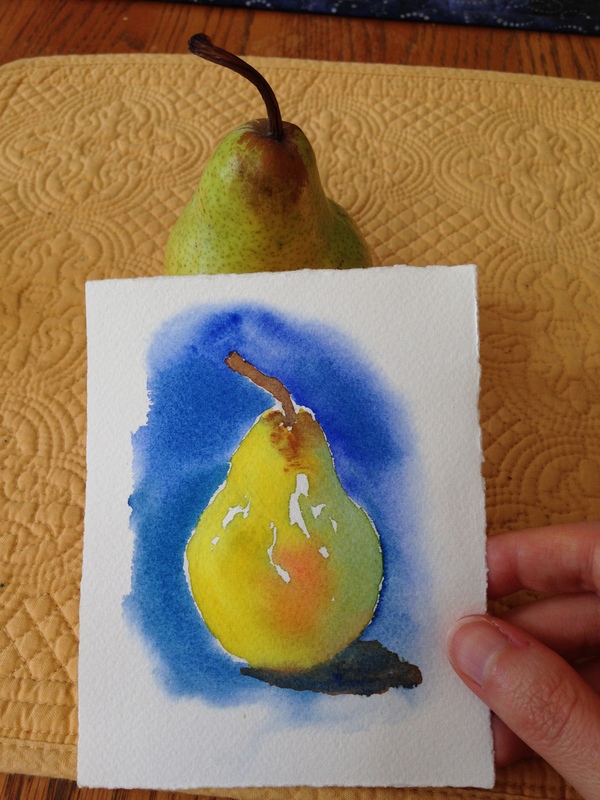 But now that I’ve done this one, I can understand why artists enjoy pears as subjects. They have so many cool curves and colors. They are just so cute, too!! hehe! That is terrific. Keep going with the color. Thanks, Kirk! I plan to, at least this month! We’ll see what develops. Looks great – like your workings with color in this piece! Have a lovely weekend. Thank you, Mary! Here’s to improvement this month. It’ll be interesting to look back a month from now and see what’s taken place. Have a great (almost) weekend! Thank you, Inari! I hope to improve this month. Time to really focus on this. I’ve fallen head over heels for watercolor. 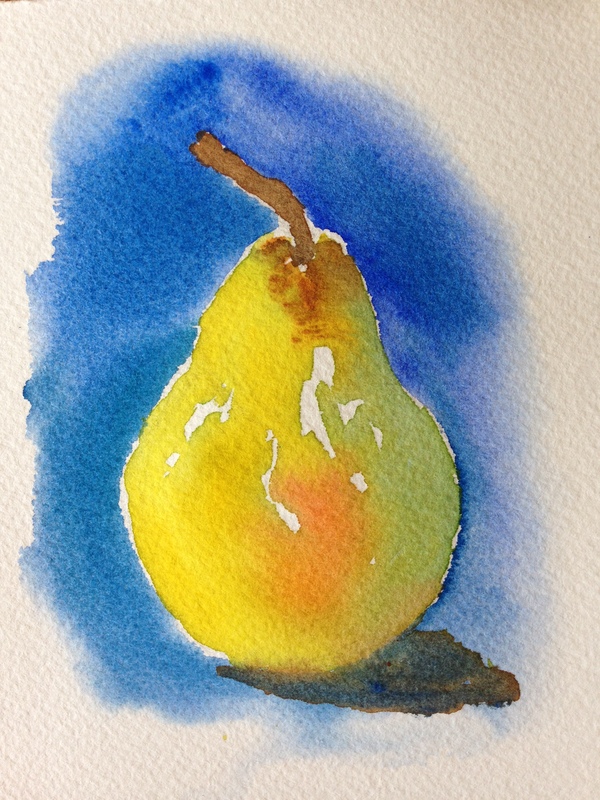 It’s a great idea to draw/paint everyday and you will see the benefit of it… improvement will always follow (saying that… I feel with art I’ll always learn new things) Can’t wait to see what you get up to with the watercolours.. the pear is a great start and looks lovely. Thanks. I agree, it’s all about new challenges; even tackling more challenging subjects can be a whole new ball of wax! The colors just pop. Clean and clear. You will learn a lot by doing a watercolor a day. There have been many times I have lined up the pears in a supermarket to see which ones will stand up best for a still life! Thanks, Rebecca! I have soo far to go, but at least I’m moving forward. Thanks for the encouragement! Definitely moving forward fast! This one looks like a great leap forward to me. Fab job. I watched a class by Charles Reid at this link: https://www.artistsnetwork.tv/learn/course/painting-flowers-in-watercolor-with-charles-reid-part-1/video/video This inspired me to do the rosebuds a few days ago, and now…..he’s inspiring me to do so much more. He has a very loose style and is a wonderful teacher! Thanks so much, Cam! I’m so glad you like it. It helps so much to get great feedback from other artists. Thanks again! Have a great (almost) weekend! Lance, you just made my day! Thank you very kindly, my friend. Wow, I’m blown away by the comments on this painting! Thank you so much! I still feel very much like I’m playing Russian roulette whenever I pick up a watercolor brush. Well, in a good way, but still….a chancy game! I never know if it will turn out. I guess the more I do it, the more sure I’ll be? But I still have so much to learn. Thank you so much for your kind comment! That’s so pretty! It looks good enough to eat. I always love your watercolors. Good luck with your month-long challenge; I’m looking forward to seeing what you come up with. Looks great to me. I love watercolor. It’s one of the best mediums, to me. I still think shadow and light is difficult to capture in art, no matter how much I practice. The eyes play tricks on us. I’ve tried using black and white photos to see if that’d help me learn to discern the differences, and even then it’s difficult. The quick paintings are beautiful, fluid, and this one has a great mix of warm and cool. Loving it! Thanks, Serenstar! It was fun to do. I may be becoming addicted to pears….they’re so cute with so many edges! Maybe if the lighting is just right and the shadows are exaggerated, it would be easier? What do you think? Beautiful, Laura. You’ve turned a dull old pear into something lovely. I do like how you take any old object to draw, even if it is a pear, or your foot! Lol thanks Fi! I draw every day….so I can’t be too picky. And honestly, pears are addictive to draw. I never knew this. They’re very cool if you stare at them. And cute! I’ve never been a fan of pears, but they do have a nice sort of shape. Quite romantic. Sad they’re kinda grainy. Did you get one just to draw? Hehe. Poached pears are quite nice. Yeah, believe it or not! I am getting lots of mileage from it, though. I’ve been drawing it at night, in different mediums, in my journal, and I’m hoping to paint it again, maybe in a more complicated still life. I’m not sure still life is my thing, but the videos I’ve seen for Charles Reid are mainly for still life. I just got a book by him (through ILL) that’s all about painting flowers. So that should be helpful too. A worthy goal! I really like the pear – and the vivid color contrast. Thank you! It’ll be interesting to see where I am on August 1. I may decide to do this for another month! Or I may want to throw my paintbrushes. Let’s hope for the former. I do like the little pear. They’re so cute! LOVE! I think the shadow is in the perfect place… and the colors are just perfect! Your watercolors are beautifully done. Thank you very much! I found some videos by Charles Reid, and he has been a huge inspiration. He paints very loosely and delicately. And with fresh colors and lots of paint. So, I’m learning a lot. How much time do you take each day to grow your talent? Well, to be honest, I live and breathe art. lol! I don’t spend much time actually doing it, because life, you know. But I try and multi-task it in with other things. Like, I’ll listen to art videos in the shower and watch them while brushing my teeth, or making food, that kind of thing. I spend less than an hour a day painting, usually closer to 1/2 hour, which is part of what keeps me from something larger. And then when we’re winding down in front of the TV at night, I have my art journal down there. I’ve been drawing something every night in it for a few weeks. Actually trying to draw vs. just playing around. It’s definitely improved my drawing skills. This is what got me thinking what if I painted something every day. It’s just a bit more time-consuming, but … it’s amazing what happens when you do something every day – whatever that something happens to be. It is amazing what you can create in just a few minutes, and that daily drawing is so helpful. I can notice a difference in my own art when I take the time to draw daily… or even just sketch. You grow so much. You see things so much better.